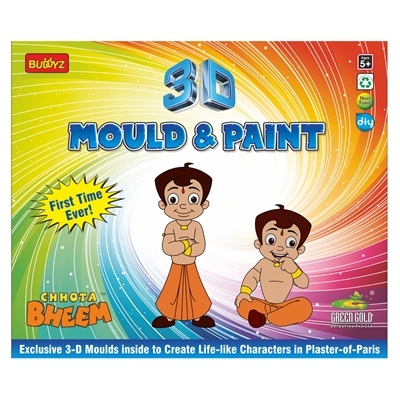 Chotta Bheem Do-it-Yourself - 3D Mould & Paint consists of a mould, a packet of white plaster, a paint-brush, a multi-colour paint-tray, a measuring glass and a plastic knife. Put some water and white plaster in a bowl in an equal proportion and mix well, after which it has to be poured inside the mould and air-dried for about an hour. On drying and removing the pieces, finish them with the knife provided and paint the 2 Chhota Bheem pieces as per the given reference or to your own imagination. The given mould can be used again & again. You may also use other available colours & paints on the moulded characters. Use your creation to adorn and ornament your home. Doing it yourself is lot of creative fun and great education too.